Whether you loved it, hated it, or couldn’t care less about it, you’ve got to admit that Disney’s Frozen has taken the toddler to tween (and beyond!) market by storm. Creator of the film, Chris Buck, braved the cyclone to tell his story to an eager crowd at Newcastle’s Civic Theatre last week. 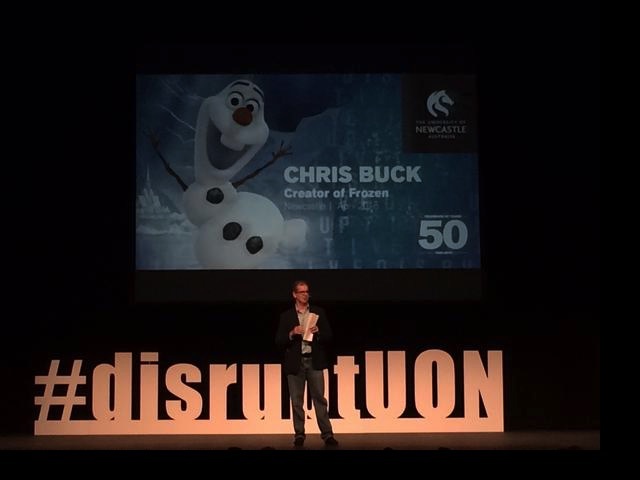 Discussing his own life story – entwining both his personal and professional journey – Buck’s talk No Regrets: Behind the scenes of a creative life was part of the University of Newcastle’s Disruptive Innovation Works lecture series. As someone who is fairly indifferent to animated feature films and certainly isn’t studying to someday make a big break in Hollywood, I was surprised how inspiring, interesting and tweet-worthy Buck’s talk was. Perhaps I should’ve given more credit to the man who spent his 50th birthday collecting an Oscar for his efforts. He’s an engaging speaker able to call upon a raft of life experiences to make thoughtful comments on a range of topics. Elegantly answering audience questions on Disney’s portrayal of social and gender diversity (“Disney isn’t a machine. 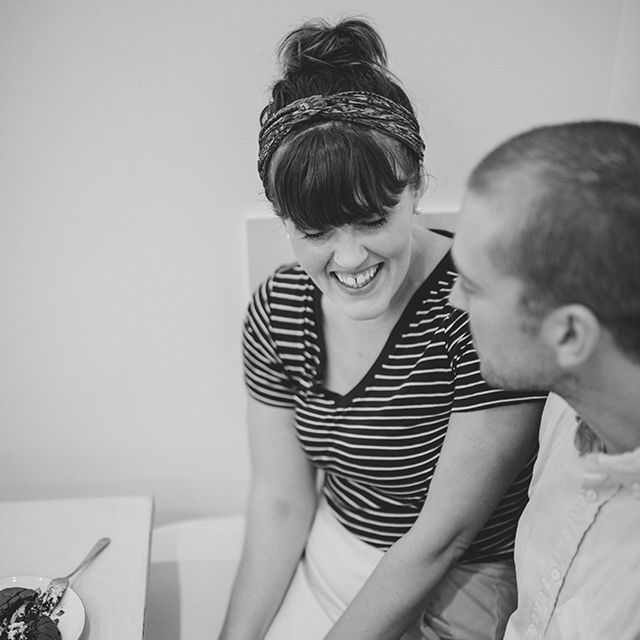 We’re people. We respond to society; we’re part of it”) through to sharing enviable wisdom gained following his son’s sudden death, (“You can inspire people, give them hope, make the world a better place”) Buck has clearly come a long way from his days as the reserved and oft-forgotten about middle child of six. Buck’s career so far has been mostly conventional; albeit highly successful of course and peppered with big name mentors and anecdotes about the ol’ uni days with his mate Tim. Tim Burton, that is. He says one of his secrets to success is keeping in touch with those old friends – the quiet chap rocking the cardigan in your class could well be your ticket to collaborative success. As a director, learning to say no was Buck’s biggest take-home tip, alongside allowing for failure to be an option – it’s the key to creativity. My favourite piece of advice though was around not getting too attached to your ideas before you’ve pitched them. When Buck was considering returning to the Disney fold, he was asked to pitch a so-good-they-can’t-refuse film idea to seal the deal. Rather than put all his hopes and dreams on one big idea, he worked on three options in the hope that at least something somewhere in one of them would strike interest with the team. Strike interest it did: one of those became Frozen and another is currently in the production pipeline! While the broader learnings of his life were artfully delivered, Buck’s behind the scenes directors-commentary style knowledge was really interesting to me. The lengths he went to with research for Frozen, for example, show that so much more than I thought goes into crafting a quality kids’ film. The animation team were taken on an arctic excursion to better understand how a young woman in a heavy dress would walk through deep snow. They had singing lessons to learn more about how an effective singing body moves. A reindeer was brought into the studio to bring clarity on animating such a beast. Even a hair stylist was recruited to design the ice princess looks which are no doubt helping to drive the braid’s current resurgence. Plenty of companies (such as the one I work for) conduct customer research, competitor analysis and delve into data to help make decisions, but for some reason it surprised me that the teams for animated films would do this too. Just because a movie might fit in the “kids” category, doesn’t mean it’s not huge business; Disney didn’t just fall into its multi-billion-dollar profit pool! Interestingly, while all this research is evident in the film, Buck was quick to point out that “we don’t create realistic worlds; we create believable ones”. He said that making an animated film too realistic can actually be creepy. The research done by the teams on reindeer, for example, gave them the knowledge that the animals are “dumber than cows” and that they go through antler-shedding seasons, which often leaves them with a not-so crowd-pleasing bloodied stump or two atop their head. Needless to say, Frozen’s reindeer Sven shows no signs of a sad case of lost antler but does show the far more palatable and humorous stupidity trait. But of course, all the believability is nothing without a decent story. Buck said that once the film’s “true north” was determined (Anna’s act of true love) every decision was made with that in mind. Originally, Buck said, Anna and Elsa weren’t going to be sisters and Elsa was shaping up to be a villain. I couldn’t help but think of parallels with Wicked’s misunderstood Elphaba with this revelation. Once the now plague-proportion viral hitLet It Go was brought to the set though, the film adjusted its course. I have to say, not being a Disney diehard or a wannabe animator, I wasn’t jumping out of my skin for this talk when it was first announced but Chris Buck had me drawn in from the moment he hit the stage. Thanks to The University of Newcastle for bringing him and his world of knowledge to our cyclonic shores. Such interesting insight into the creative processes of other people and other industries shared by a truly talented creative leader.